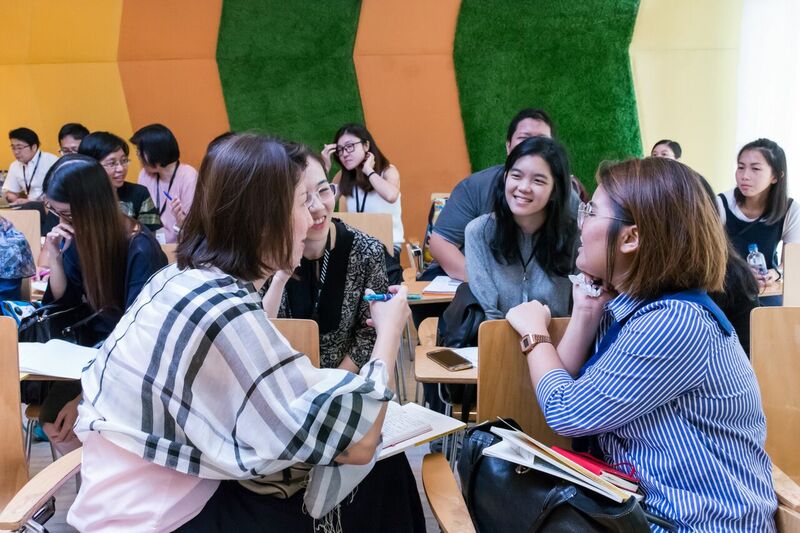 The AFCC Teachers & Parents Forum provides teachers, educators and parents with the skills and knowledge to impart early literacy, and a love for books, writing and reading. It also offers parents, teachers, and other related professionals the opportunity to get support, information and advice on nurturing early learning and bilingualism at home. Take a dive into the mysteries of the young child's brain! Recent discoveries about the brain and language development take centrestage in this session with Dr Mary George, who will also be sharing how such findings can be applied in the classroom. Most would agree that parents are indispensable in teaching early literacy, but how should they go about giving their young ones a head start? Join Ruth in tackling this question, as she tells us more about Unang Aklat, a grassroots initiative in the Philippines with a similar mission. Dyslexia comes with new challenges, but it also presents opportunities. In this session, discover more about the everyday experiences of dyslexic learners as Nur Ashikin brings an educator's perspective to the discussion by sharing some strategies from the Dyslexia Association of Singapore's (DAS) Main Literacy Programme (MLP), and how it provides intervention for these learners. Within multi-cultural Singapore, the Tamil community continues to promote the formation of cultural and national identities through children’s literature. Yet, creators and readers still struggle to define cultural authenticity. The speakers on this panel will discuss how cultural authenticity is defined and presented in 50 locally published Tamil-language picture books and will share how they can be utilised to engage children. Writing on customs and traditions is never an easy task, with new questions of representation and authenticity challenging writers. This presentation takes the first step towards answering these questions, from picking up the right theme to adjusting your stories for young readers. Andy invites you into the world of his debut children's book The Rainbow Dragon, where Rainbow is a young dragon who finds it hard to control her fire. Rainbow must learn how to express her feelings, before she unleashes a multi-coloured trail of destruction. Andy will also share the important lessons he conceived for his novel, and how the messages of empowerment remain relevant for children of all ages. Educators recognise that student engagement makes a difference to their motivation to learn and make progress. Join Elaine in this workshop, as she explores the theoretical basis and practical benefits of using drama games to improve the learning experience. Participants will be equipped with the skills they need and be able to adapt such activities to their own classrooms' needs. As this workshop involves movement, participants are strongly encouraged to dress comfortably and wear comfortable walking shoes. Females are advised not to wear dresses. Learn about activities contributing to the Home Literacy Environment, and how it plays a part in language development outcomes in children. This session will get you up to date with the latest research findings in this field, as well as the practical techniques to conduct dialogic reading effectively with children. This session equips teachers with relevant knowledge and skills to promote language learning and development in the pre-school classroom. Through a series of interactive case study discussions on experiential learning, teachers will understand about the various stages of language development, and differentiate between language delay and disorders. How can concepts like respect, equality and action be introduced to our children in a way that will resonate? By seeing stories as mirrors into one's cultural experiences and as windows into others', Tonia speaks about empowering learners to become self-aware, resilient and deep thinkers. Do digital natives have different life experiences? If so, it may be time to consider different methods of teaching English as a Second Language (ESL) to this new generation. This experience sharing session introduces some low-cost tools and discusses how ESL teachers may make easy use of them in their lessons. Bring the book from the heads to shoulders, knees and toes! In this session, Derin Övgü Öğün and Ilgim Veryeri Alaca show participants how they can gain a greater appreciation of the surrounding space by incorporating their own senses into the reading experience. Child and caregiver behavior take centrestage in this session, which introduces the MISC (Mediational Intervention for Sensitising Caregivers) Approach as a strategy for caregivers to positively influence learning environments. Hear from educators at the Dyslexic Association of Singapore, as they also share how they have adapted the MISC Approach into five principles for DAS' specialised learners. From parents to educators and curriculum developers, anyone working with pre-school children is welcome to attend this workshop, where Aileen will be sharing her experiences in incorporating music and movement to enhance early education. This session features the popular alphabet poetry book Rhyming Around Singapore, published in 2014, and illustrates how rhyme, repetition can be useful tools to facilitate reading and memory in young children. A language teaching strategy particularly effective with child learners, Reader's Theatre adds dramatic flair to written texts while doing away with the formal constraints of traditional theatre. Kiren and Donna will walk you through Reader's Theatre, and its usefulness in developing the reading and speaking skills of young learners as well as attaining communicative competence. Neuroeducation is an emerging field concerned with understanding how the brain optimally learns, and marries educators with neuroscientists and psychologists. This talk introduces the potentials such a collaboration offers, and how these can be harnessed into a new teaching methodology. Add to Calendar 09/07/2018 01:30PM 09/07/2018 02:30PM Asia/Singapore Living, Writing & Creating, S.I.E.W D.A.I Style! Enter Dr Jayaraman's world of sci-stories, where facts meet fiction. These stories retain the characters children are familiar with, but have also weaved in concepts like observation, hypothesis, and inference. Hear from him how sci-stories can innovatively develop scientific literacy and curiosity, along with the techniques and processes of writing them. Those with a stake in young literacy would recognize that school libraries are crucial spaces for cultivating lasting reading habits. Join Chin Ee as she shares her research and study visits, and examines the significance of our school libraries. Introducing the New Stars Island (Xin Xin Dao) Graded Picture Book Series, Dr Tan Chee Lay will discuss parent-child reading in the home environment and how it engages children in reading Chinese texts. At the same time, this session also reiterates the unique advantages picture books possess in cultivating reading habits that last. Mythology matters, but how should we refashion and reinterpret old stories for young sensibilities? Rixou, whose works deal with the fantastical and the modern, discusses how the areas of reader engagement, character creation, world building and book design can learn from both the old and the new. Participants will be introduced to Dr Tan Wee Kiat's picture books, which use stamps to depict unique scenes of Singapore life. In particular, one such book, Singapore: Many Races, One People, will be highlighted for its usefulness in National Education and in engaging both parents and children. By unearthing delightful connections between the visual and the verbal, this approach has found particular success with shy readers in strengthening their English language fluency. Say goodbye to boring writing, as author and publisher Cynthea Liu guides you in helping young people express their voices when crafting a personal essay through a series of practical at-home or in-class exercises. While a storyteller is an artist honouring the artform, he or she is also an educator managing the classroom and its challenges. In this session, take a look at what two storytelling projects with preschool and secondary students have suggested about the role storytellers play in education. Professor Ahrens will share how teachers can draw inspiration from children's literature to design learning outcomes in writing assignments. Two picture book texts will be discussed, followed by a hands-on segment where teachers will write creative responses to engage personally with the student experience.